Industrial production shocked to the downside this morning with a drop of 0.6%, the most in 3.5 years vs. an Econoday Consensus guess of -0.2%. Moreover, last month was revised lower, from -0.2% to -0.4%. November was another weak month for the industrial economy, in part reflecting unusually warm temperatures that are driving down utility output. 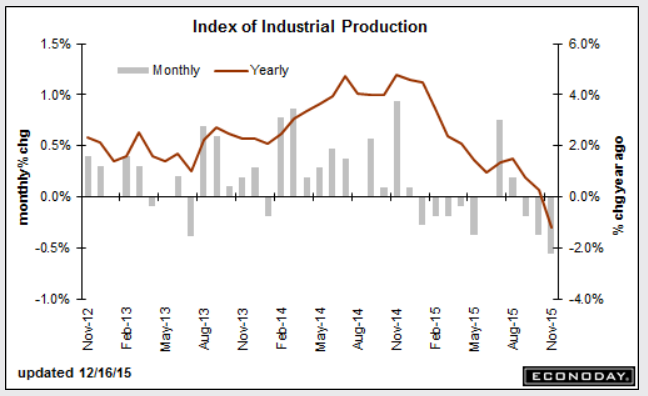 Industrial production came in at the Econoday low forecast, down a very sharp 0.6 percent in November. This is the biggest drop in 3-1/2 years. Utility output fell a monthly 4.3 percent after falling 2.8 percent in October. Mining, reflecting low commodity prices and contraction in energy extraction, has also been week, down 1.1 percent for a third straight decline. This brings us to the most important component, manufacturing where October's 0.3 percent bounce higher (revised downward from 0.4 percent) now unfortunately looks like an outlier. Manufacturing production came in unchanged in November reflecting weakness in motor vehicles, down 1.0 percent in the month, and also a dip back for construction supplies which fell 0.2 percent after a weather-related surge of 2.3 percent in October. One positive is a slight snapback for business equipment which, after declines in the two prior months, rose 0.2 percent. All the weakness is pulling down capacity utilization, to 77.0 percent in November for a heavy 5 tenths dip. Utilization is running more than 3 percentage points below its long-term average. Mining utilization is now under 80 percent, down 1.1 points in the month to 79.4 percent. Utility utilization fell 3.4 points in the month to 74.5 percent with manufacturing utilization down 1 tenth to 76.2 percent. Excess capacity, though not cited as a major factor behind the lack of inflation in the economy, does hold down the cost of goods. Year-on-year rates confirm the weakness, down 1.2 percent overall with utilities down 7.6 percent and mining down 8.2 percent. Manufacturing is in the plus column but not by much at plus 0.9 percent. Weather factors are skewing utility output but otherwise, readings are fundamentally soft and reflect the downturn in global demand made more severe for U.S. producers by strength in the dollar. For comparison purposes, let's check out what Bloomberg had to say last month vs. what I said last month. The comparison can be found in my November 17 report Industrial Production Unexpectedly Declines Again: Don't Worry, It's the Weather and Mining. In a deceptive headline, industrial production fell 0.2 percent in October but weakness is in utilities and mining. Boosted by construction supplies, manufacturing, which is the core component in this report, rose a very solid and higher-than-expected 0.4 percent to end two prior months of decline. ... Construction supplies jumped 1.7 percent in the month in a reminder of how strong construction spending is right now. ... Utility output, reflecting the nation's unseasonably warm weather, was really down October, falling 2.5 percent. Year-on-year output is down 1.5 percent. Mining output, the report's third main component after manufacturing and utilities, fell 1.5 percent. This component, down a year-on-year 6.9 percent, has been getting hit by weak commodity prices. ... It's not been easy to find good news out of the manufacturing sector which makes this report a standout of sorts. Gains in production, however, would have to extend through year-end to turnaround what has been a weak, export-hit year for the manufacturing sector. If you throw out consumer spending, utilities, mining, total utilization, downward revisions to total utilization, and pray consumer auto buying holds up, this was an excellent report. Industrial production is down for the eighth time in ten months. There is no deceptive decline, nor hidden strength. Everything is in plain sight. How to Uncover the Hidden Consumer Strength!